Equipment versatility is important these days and Robur has come up with an attachment that many contractors may soon be making part of their worksite arsenal. 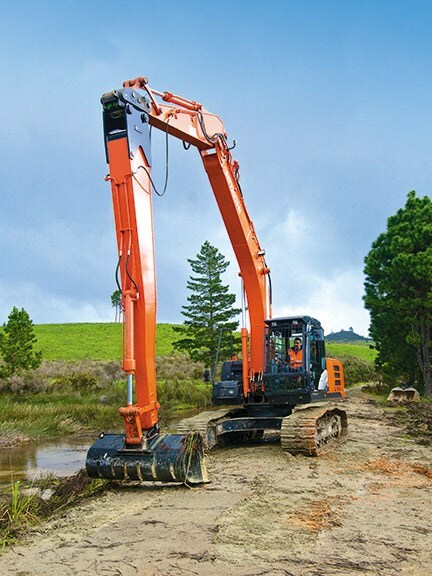 For quite some time, long-reach excavators have had a monopoly in the marketplace when it comes to carrying out any extended reach excavating work. Recognising this and intending to overcome it, Robur Attachments set out to develop a serious and affordable contender that would enable this type of work to be carried out by a wider range of job tenderers. Simplicity is at the forefront of the recently released Robur Maxi-Reach and it seems that this innovative attachment will indeed increase the type of work a conventionally equipped contractor will soon be able to carry out. 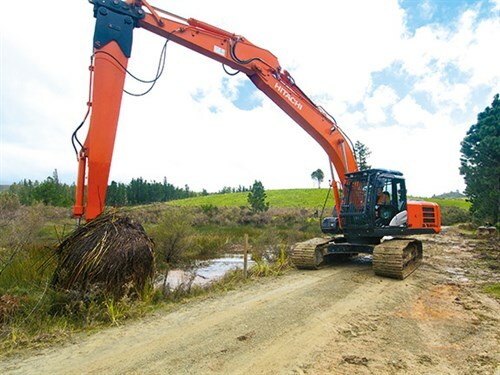 Consisting on an extra arm section that gets connected to an excavator, the fitting of a Maxi-Reach attachment enables a standard (attachment piped) excavator to be very quickly converted to a long-reach machine. Available in various lengths to suit different-sized machines, current Maxi-Reach attachment models enable an extra seven metres reach to be achieved. Fitting the Maxi-Reach takes only a few minutes and can be carried out by the machine operator without any extra help. Firstly, the bucket is removed from the excavator's quick hitch. 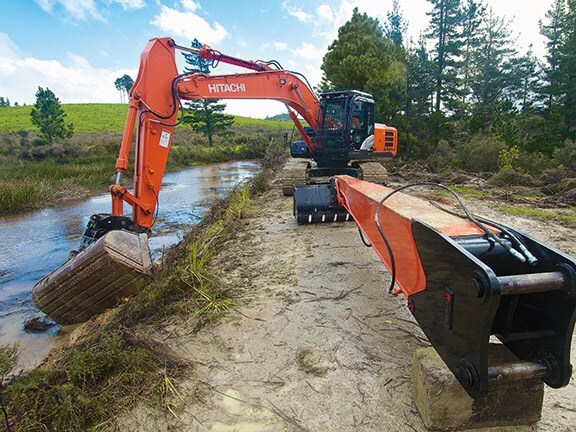 Then it is only a matter of attaching the Maxi-Reach arm to the quick hitch and then connecting the two hoses to the excavator's hydraulic system. Being a known type of fitting system, minimal new training is required as most (if not all) operators will know and be comfortable with connecting and disconnecting a Maxi-Reach attachment. Operation of the unit is slightly different to the normal excavator operating mode, as with the Maxi-Reach fitted there is now a third section to the machine's arm. This is where the attachment valve comes into play, controlling the curling and uncurling of the bucket. New users to the Maxi-Reach report that it takes no more than a day to become fully comfortable with using the attachment. What reach can I expect? 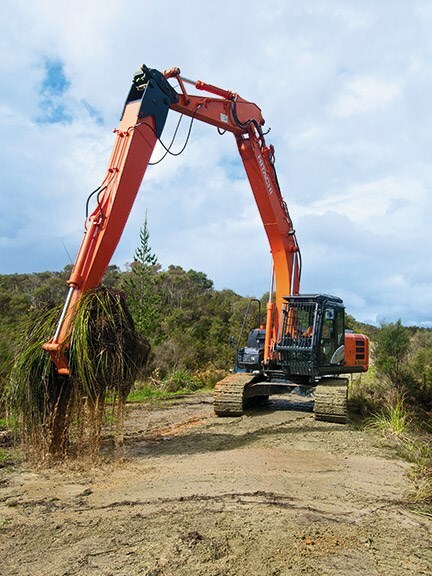 When fitted to a 20-tonne excavator, an extra five-metre reach can be achieved with a Maxi-Reach without any modifications, with up to a seven-metre reach with the largest model. Robur Attachments can also custom-make other sizes for larger or smaller machines. I had heard a bit about the development of the Maxi-Reach through the pipeline, so understandably was keen to see one of the things in the flesh. 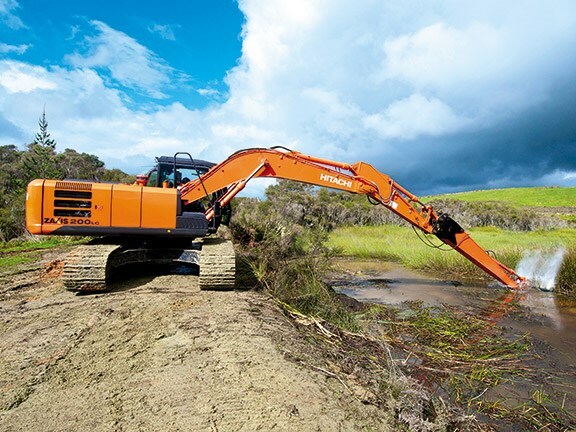 Arrangements were made to meet up with the Robur crew at a Northland farm that was in serious need of having a couple of dams cleaned out, which sounded like an ideal contender for some long-reach work. The fitting of the Maxi-Reach to the excavator was a straight-forward process that was handled easily by the operator. 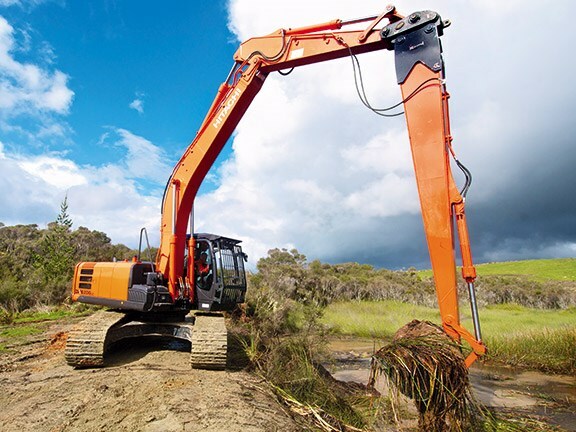 Once connected, the first thing that is immediately noticeable is the unusual shape that the arm becomes with the extra section added in, and the excavator almost has a praying mantis look to it. 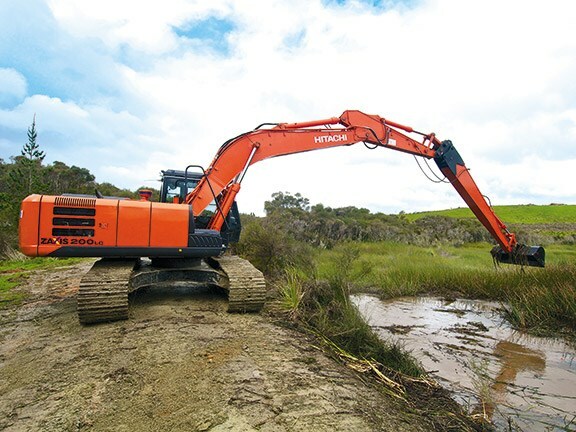 Hydraulic hoses connected, it was then into a demonstration by the operator, while I paid particular attention to the weight handling ability of the Hitachi ZX200LC. With the extra five metres added to the arm. I shouldn't have worried, as the machine easily handled the Maxi-Reach, and I wondered if this was due to the three-section configuration. Of course, fully-loaded, it was necessary to keep the arm closer into the machine, but that is the rule of thumb with any excavator work. Following the demonstration, I was given the opportunity to try my hand at the controls. This was somewhat amusing, as it took me a few minutes to work out the different configuration setup, as the 'normal' bucket curl now operated the Maxi-Reach, and the attachment valve (attachment control) operated the Maxi-Reach's bucket. Actually, it probably sounds a little confusing as I'm describing it, but it is pretty straight forward once you get your head around it. The operator said that it took him a day to become fully comfortable with it, and I reckon his estimation would be about right. Anyway, once I got my head around the controls, I was able to get into cleaning the dam out. Fully extended, the Maxi-Reach still felt stable and the ZX200LC didn't want to throw me around at all. After using the Maxi-Reach for a while, it becomes plainly obvious that it does the job it's designed for very well, and I am a quick convert. But, I guess the real question is: Would I buy one for my business? Yes, absolutely. Actually, I will go out on a limb here and say that this simple, cost-effective attachment is a game changer when it comes to long-reach work. If there is not one of these in the arsenal of most contractors in the near future, I would be very surprised. 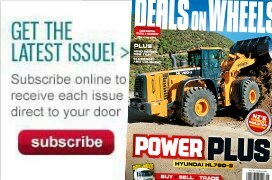 For the latest reviews, subscribe to our Deals On Wheels magazine here.